Wholesale Distributor of a wide range of products which include hydraulic mobile monoblock valve and monoblock control valve. With deep understanding of the market and the application area, we have come out with high quality Hydraulic Mobile Monoblock Valve. Offered monoblock valves are widely accepted fort industrials working and have capacitive to perform heavy operations for long period of time. These monoblock valves are manufactured with precision utilizing top notch material & latest techniques following the industrial norms. Our offered monoblock valves are checked under the direction of quality controllers before supplying in the market. 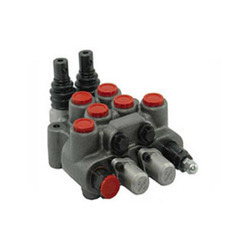 Monoblock Directional Control Valves are of the Highest Quality, These valves are readily available and are performance Oriented. Manufacture with Precision,. These valves can withstand High presures and can be used effecetively. In addition, these valves are widely for mobile, construction equipment, garbage compactors, Tractors and industrial applications.